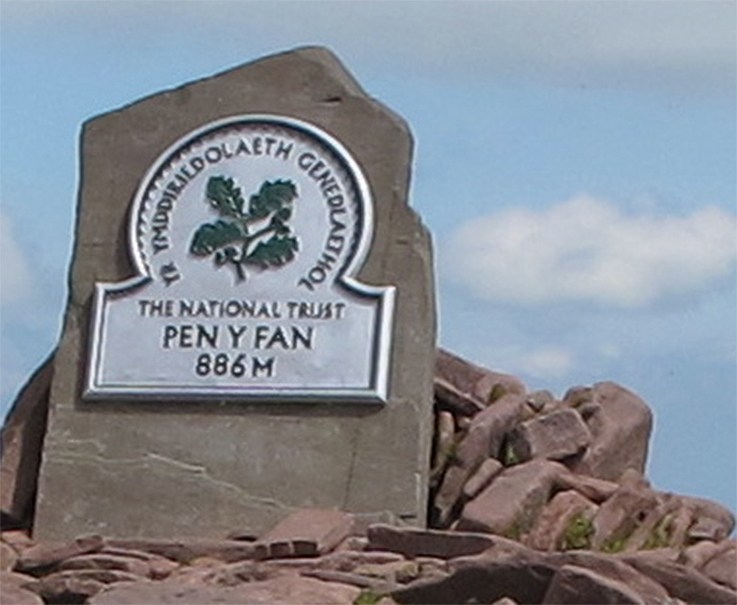 This day, blessed with sunshine and cloudless skies, we set out on Plan A, to climb not two (you always bag two peaks on this walk) but all four of the Brecon Beacons guardians, Corn Du, Pen y Fan, Cribyn, and all the way around the rim to Fan y Big to stand on the fabled Diving Board, some of our party more keen to do this than others. We parked at the top car park opposite the Storey Arms, already crowded despite the early hour. At the gate leading onto the pathway we passed a returning lone hiker who grumbled to us that it was like a village hall event at the top today, so many walkers up there already. He probably would have been happier up here yesterday, lonely in the mist. 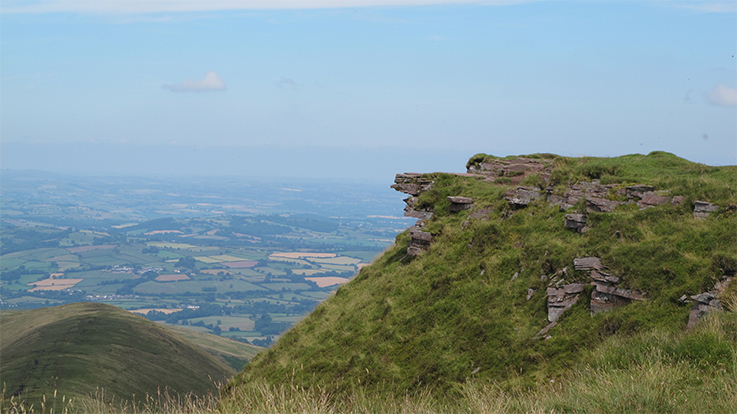 You become immediately aware of the cut slate stones, individually hand set edge up into the ground, literally a million of them, stretching up towards the first peak of Corn Du and beyond. As it transpires the entire walking pathways of the Brecon Beacons feature this use of slate, helping to protect the paths from erosion, providing grip to walkers in the snow and ice conditions that mostly prevail up here. At this early stage of the walk we marvel at the workmanship of the stones, later we feel every bone-jarring-one of them as weary muscles support sore toes pivoted on the raised edges, whether on the rise or descent. Thankfully, the views in every direction are worth the effort and it is simply part and parcel of the life of intrepid adventure, which is the sentiment we keep the ankle-biters motivated with. 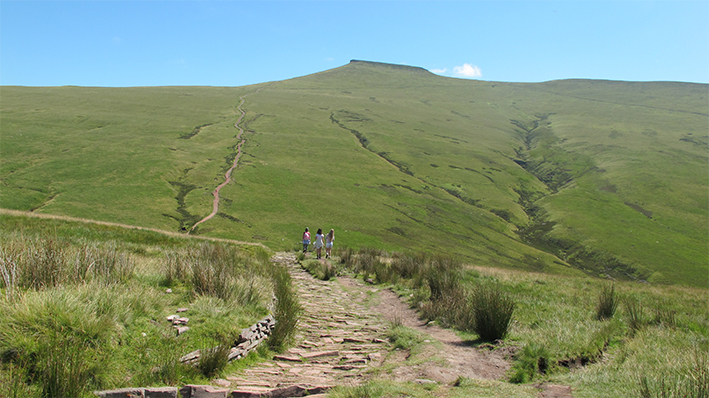 We reach the turning point for the last steps to Corn Du’s peak. This gives us a first look at the very steep drop away to the northern side, it is like the bowl of a volcano with the fire gone out. The tarn far below looks inviting but the only way down from here is fast and perilous, not one for us. We look and marvel at the view, and realise why we were warned off climbing this the previous day when the clouds had descended in a thick shroud. This is not a track to be clueless upon, one foot at a time, probably on hands and knees, might be the best advice in mist. But we were blessed with clear skies, and could see forever into the distances all around, this was our luck-filled day for sure. 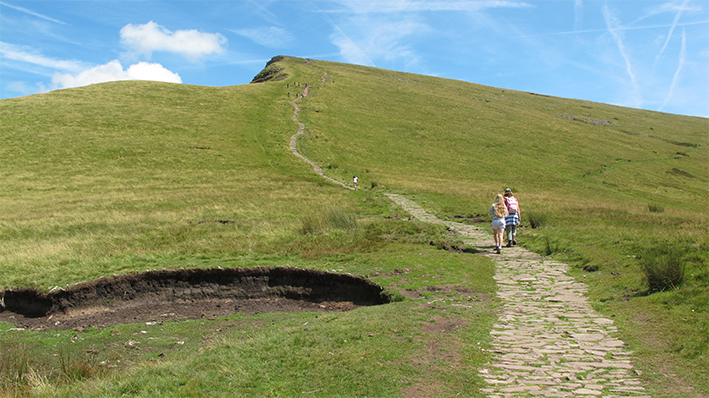 Onwards, up the final steep steps and team White collapses onto the flat plateau that marks the summit of Corn Du. From here Pen y Fan is just a hop, step and a jump away .. No bother for the rapidly hardened walkers, in fact a sudden spurt of energy from the youngsters who decide it is imperative to beat the parents to the next milestone, the beacon on top of Pen y Fan. Some terrific photos taken at the cairn, and a kind stranger steps forward to help give us a photograph to remember Team White’s achievement. Helen White was not yet satisfied, we had two more peaks to go, water was low, but spirits high so we settled down for a quick lunch break before the next, and more arduous part of the day. Lunch was taken in company of a crazy sheep. Fellow walkers taking selfies with the sheep who shares their love of crisps and coke, has zero fear. We spot sheepie looking our way and decide it is time to hotfoot to the next phase of the walk, Cribyn. 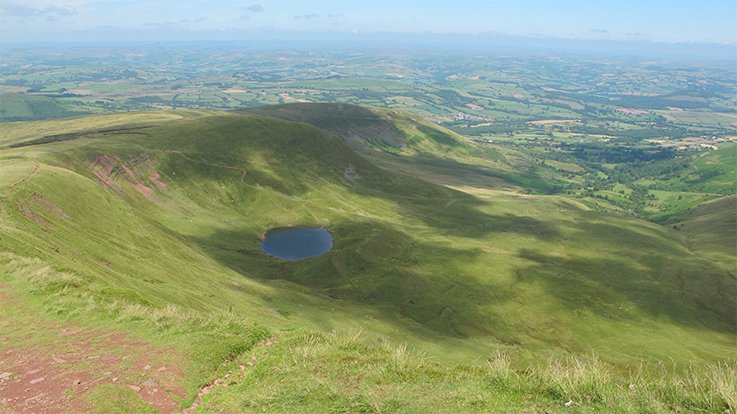 Now the hard work began in real earnest, there is a benign pathway off Pen y Fan’s summit, almost Roman Road like, enticing, calming, and we walk as innocents to the edge, then see the steps reaching down steeply far below. 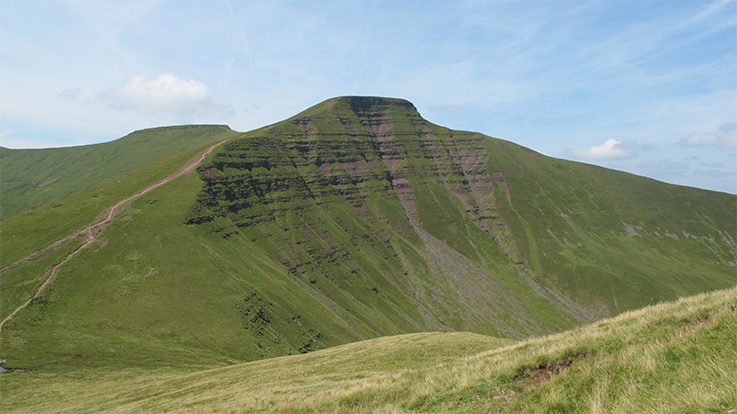 We start our careful progression towards Cribyn. Be warned, knees will hurt, it is one longish step down at a time and all the while we can look ahead and realise that as we reach the bottom of this tortuous descent, there will only be a short flat section before the ascent rises equally steeply to Cribyn. 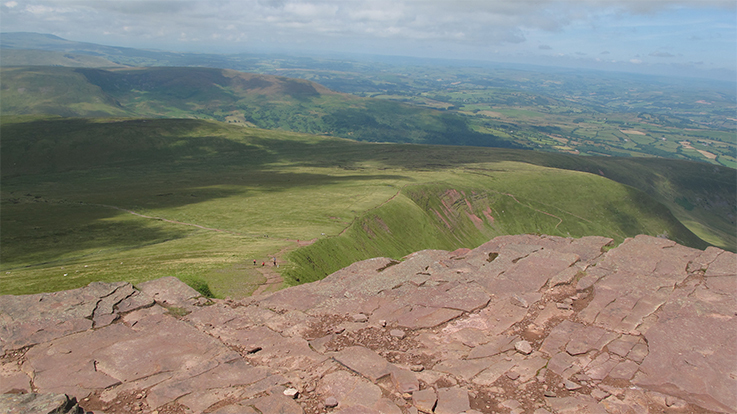 Back side steps of Pen y Fan seen from half way up Cribyn. We are overtaken by what is either the Welsh front row, or SAS soldiers in training. Impressive, very impressive. “Who runs wins” sort of impressive, the back packs can’t be helping their screaming leg muscles. Our young guest, female, Sporty Gal, decides this looks like fun and we have some fine photographs of her fast disappearing out of focus as she jogs down, along and then up, following the musclemen, before stopping three quarters of the way up Cribyn to rest, and wait for us slow coaches. It was a long wait. She has decided not to join the army after all, although she’d definitely be on their most wanted list judging by this performance. Now, after a brief rest at the summit, and the realisation that a small bottle of mineral water each is well short of required rations as we gaze into the distance still to be covered, we set off on a long rim walk towards the last summit, and the famous diving board on Fan y Big. There is a final steep ascent, a short uphill one, before reaching the inviting jutting rocks of the diving board. Here, you really earn your stripes inching out, with a few hastily taken photos to prove courage, the photographer thankfully excluded from the ritual, then we turn for home, weary limbs, thirsty throats, sun-drenched skin, and with a long way to go from here. A last look around the entire rim, we see all four peaks marking the amazing black run slopes that run down to the valley where we set up our campsite two days ago. We decide to take the advice of other climbers and on the return journey go round the backside path that skirts Cribyn. This way is definitely kinder on our feet, but there is no avoiding going back up Pen y Fan and having to rise three quarters of the way to the top before reaching the next part of the skirting trail. Even reaching this point takes sheer willpower, a lot of encouragement to keep the youngsters going, our water gone, almost delirious (it is seriously stupid to go up on these beguiling, green hills without sufficient water) and after skirting Pen y Fan we take a wrong right hand turn back towards its summit. Even on a clear day it is easy to make a navigational error. Thanks to an observant daughter we get back onto the right path, then start the long walk back to the car park, one painful slate step at a time, sun still beating down relentlessly. Doesn’t it ever rain in Wales? We rest again at a very beautiful ford, removing boots and soaking our weary feet. A conversation with a elder couple also resting up reveals that both families are from almost the same part of Dartmoor, it really is a small world out and about. 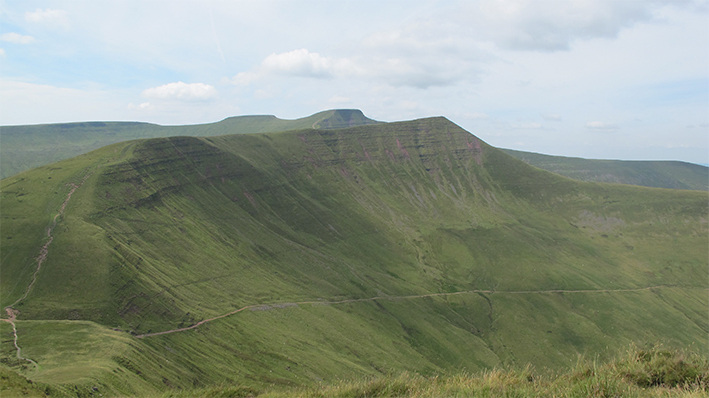 The elderly man mentioned that this was his last climb on the Brecon Beacons and we raised our hats to his doddery, determined legs and balance that took him to the top and back again, a devoted wife alongside. You can’t help but meet wonderful people in the wide open, magnificent ‘breathing spaces’ of Britain. Dehydrated, delusional, argumentative, but feeling physically and mentally challenged and satisfied we head back to our campsite, ice creams for the youngsters, a beer for me, a cup of tea for Helen. That night the sound of thunder, close by, and then raindrops pattering on the raised roof, small at first, then thumping great big ones! 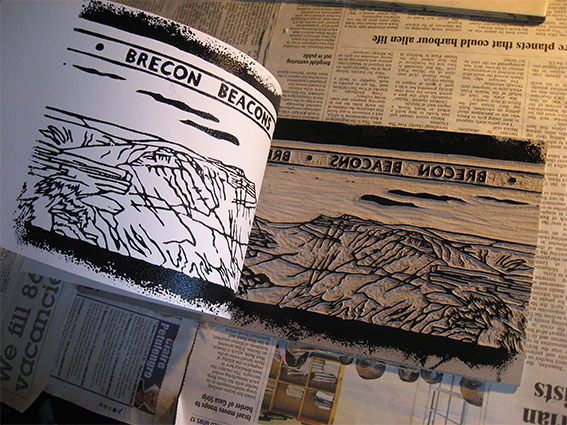 And deep sleep follows from a day’s exuberant tramping across the magnificent Brecon Beacons of Wales.